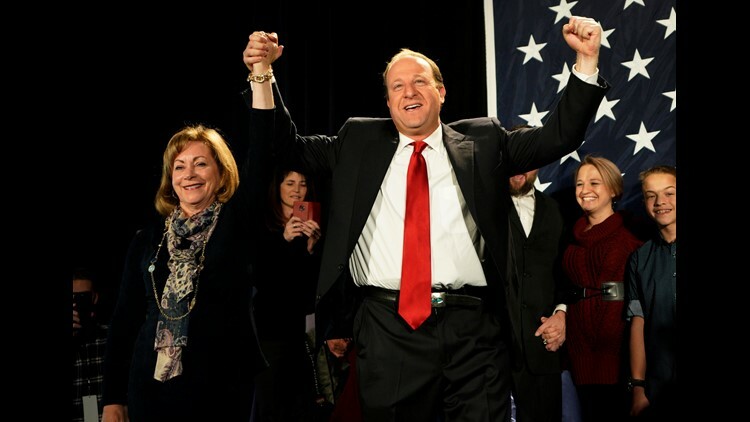 Democratic Colorado Governor-elect Jared Polis arrives onstage with running mate Dianne Primavera on Nov. 6, 2018 in Denver, Colorado. Polis defeated incumbent Republican Walker Stapleton to become the first openly gay man elected Governor in the country. The 2018 election results heralded a night of firsts, with many women, minorities and LGBTQ candidates claiming victory and making history across the country. At least 400 LGBTQ candidates ran in the general election this cycle, with 21 on the ballot for Congress and four competing in governors races, according to the Victory Fund, an organization that works to elect LGBTQ candidates. While election results are still being finalized, as many as 100 LGBTQ candidates have claimed victory as of Thursday. . Prior to the election, there were 559 openly LGBTQ elected officials currently serving in the United States, or 0.1 percent of the elected positions in the country, according to a report by the Victory Institute, an organization that works to increase LGBTQ representation in government. The group said Americans would need to elect nearly 23,000 more openly LGBTQ officials for equitable representation. HRC President Chad Griffin said the results show "millions of LGBTQ voters and allies across the nation rejected the politics of hate and fear and put Donald Trump and Mike Pence on notice." “The days of attacking LGBTQ people for political gain are over, and the American people will not stand for lawmakers who try to drum up votes by trafficking in hate," Griffin said. Here are some of the LGBTQ candidates who won their races. Democratic candidate Jared Polis became the first openly gay man elected governor in U.S. history. During his acceptance speech, Polis said he was "profoundly grateful" to the LGBTQ pioneers who came before him and for "all the work you've done and overcome." Succeeding two-term Democratic Gov. John Hickenlooper, Polis ran on a platform of moving Colorado toward universal health care and transitioning the state to 100 percent renewable energy by 2040. The Native American attorney became the first openly LGBT person to represent Kansas, as well as the first open Native American and lesbian woman in Congress. Davids captured over 53 percent of the vote, defeating Republican incumbent Rep. Kevin Yoder by almost 10 percentage points. During the campaign, she called for expanding Medicaid and treating gun violence as a public health crisis. Davids was one of two Native American women elected to the House on Tuesday. With 100 percent of the district's precincts reporting, Democratic Katie Hill led incumbent GOP Rep. Steve Knight, according to the Ventura County Star. Knight conceded the race Wednesday afternoon. In one of the most expensive House races in the country, Hill raised more than $7.3 million and campaigned on a message of bipartisanship. A gun owner who identifies as bisexual, the VC Star wrote that Hill "branded herself as the most millennial candidate ever." A former St. Jude Medical executive beat out Republican incumbent Rep. Jason Lewis and flipped Minnesota's competitive 2nd District blue. Craig will be the state's first openly gay member of Congress. Craig previously ran against Lewis in 2016, losing by a thin margin. For the 2018 election, she ran with a heavy focus on health care, stressing the importance of keeping protections for people with pre-existing conditions. Democrat Chris Pappas became New Hampshire's first openly gay congressman in the state's historic House race. His Republican opponent, Eddie Edwards, would have become the state's first African-American congressman. Pappas was endorsed by both of New Hampshire's senators during the primary campaign. "I am humbled beyond words that the voters of the 1st Congressional District placed their trust in me today," Pappas said to supporters Tuesday night. Although Arizona's Senate race was still deemed too close to call as of Thursday, Democrat Krysten Sinema, if elected, would be Arizona's first openly bisexual senator. As counties across the state continue to count mail-in ballots, the Arizona GOP filed a lawsuit Wednesday that alleges country recorders must stop verifying signatures on those ballots once the polls close. The Arizona Republic estimated there are 650,000 ballots left to be counted. The race between Rep. Sinema and Republican Rep. Martha McSally has been tight from the onset, and an official winner might not be called for days. Unofficial results put Sinema with 48.4 percent of the vote, trailing McSally with 49.4 percent. Throughout the campaign, Sinema has highlighted her past bipartisan efforts in Congress while also working to appeal to Republican voters in her state. Wisconsin Sen. Tammy Baldwin won her re-election bid, raising more than $30 million to defeat Republican candidate Leah Vukmir. Baldwin made health care a key focus of her campaign, echoing the main message her party wanted to drive home in the midterms. Oregon Gov. Kate Brown made history in 2015 when she became the first openly bisexual governor in U.S. history. On Tuesday, Brown fended off Republican challenger Knute Buehler to keep the governor seat. Oregon Democrats also strengthened their hold on the state legislature. Rep. Sean Patrick Maloney, New York's 18th District, won a third term in Congress, defeating Republican challenger James O'Donnell by around 20,000 votes, according to the Poughkeepsie Journal. First elected to the House in 2013, Maloney is New York's first openly gay congressman.